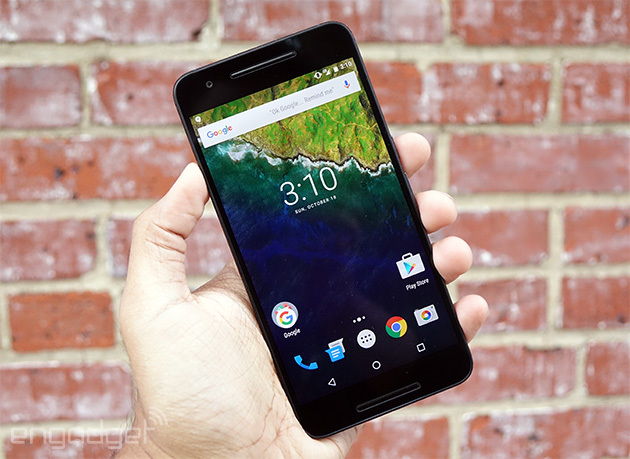 When Android 5.0 Lollipop started hitting devices last November, people could tell. Google's new Material Design aesthetic made sure you wouldn't mistake it for any prior version of the OS, which was great... especially when you consider how confusing parts of it could be. Now that Android's look has been more or less firmed up, Google set about making its operating system smoother, smarter and more battery-friendly. 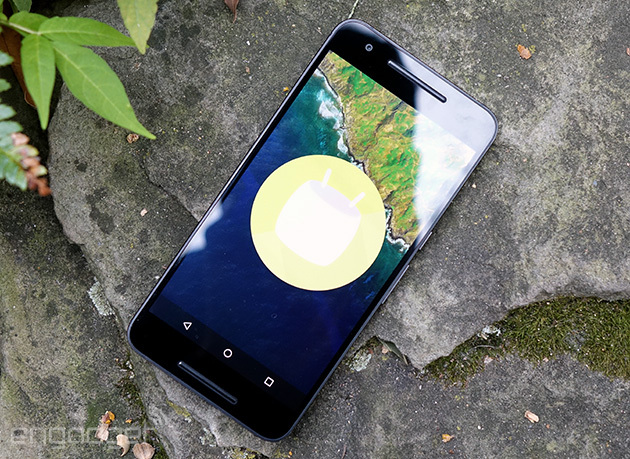 The end result: Android 6.0 Marshmallow. So, how'd they do? Spoiler alert: pretty damned well. Where did that dark mode go? While this isn't as a huge cosmetic overhaul as last year's big update, Android 6.0 Marshmallow does a great job addressing Lollipop's foibles. More importantly, Google is really flexing its contextual smarts with the addition of features like Now on Tap, and an improved version of permissions gives users a better understanding of what their apps are trying to do. Thanks to a nice dose of visual polish, too, we're left with a must-install update -- here's hoping OEMs deliver it sooner than later. How would you rate the Android 6.0? Go ahead: Take a look around. Do it quickly enough and you might not notice anything different from the big Android update we got last year. Material Design was a huge, highly valuable step forward for Android; this year's update polishes down some of the look's rougher edges and makes a few things more prominent. Consider the lock screen's font, for one -- the time is a bit bolder than it was before, better for those discreet time checks. Then there's the launcher, which some people have been getting a taste of without even updating to Marshmallow. The white background will seem awfully familiar, but that's it as far as similarities go. Remember the multiple pages of apps you had to swipe left and right through in Lollipop? They're all gone, replaced by a single, vertically scrolling tray of icons capped off with four of your most used programs sitting atop the tray. Above that sits a handy search bar, which also (thankfully, finally) lives in the Settings menu so you don't have to poke around aimlessly looking for an arcane option to change. I sort of preferred the paginated app view from days past, but the addition of a search feature is insanely helpful -- where was this before? 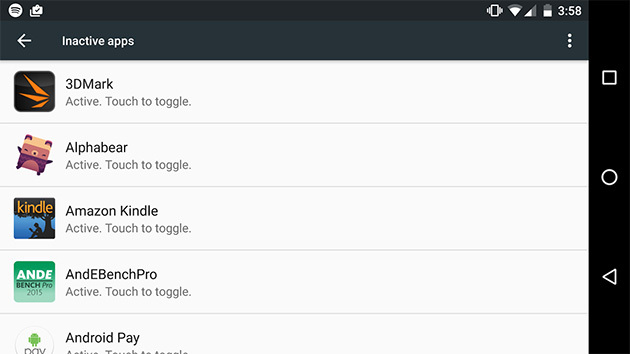 Marshmallow's actually slightly more customizable than previous versions if you know where to look. 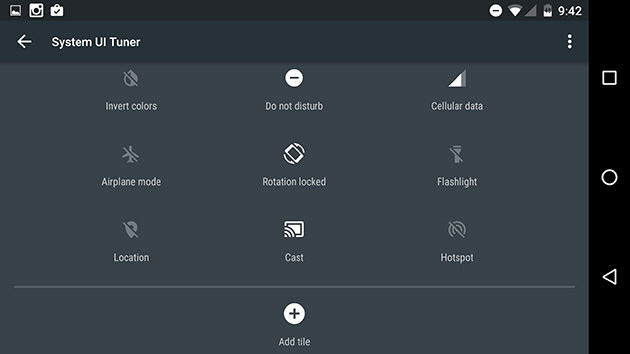 The System UI tuner we first spotted in the Android M preview is hidden by default; to access, you have to swipe down into your Quick Settings panel and press on the gear icon until it starts spinning. Once all that's squared away, you can use it to rearrange your Quick Settings icons and add a few extra design flourishes, like tacking a battery-percentage readout to the vaguely helpful battery icon. Google warns that you probably shouldn't muck around with this too much, and I'm inclined to agree (although not for system safety purposes) -- it's just that there's only so much to be done here. The same can't be said about my favorite of Marshmallow's minor UI enhancements: the much-improved copy-and-paste commands. It used to be that pressing and selecting text to share required you to decipher some arcane symbols at the top of the screen, but that's been replaced by a simple pop-up menu with -- wait for it -- the words select all, copy, paste and web search. That latter option is on a separate "page" from the others; while that's mildly annoying, it's still worth actually having command buttons that make sense at a glance. Once the sharing mood sets in, you might also notice what Google calls Direct Share. When you try to share content from certain apps, you'll get the option to send it directly to contacts instead of just opening that stuff in another app. Incredibly handy? You bet, but sadly, very few apps support it right now. Now on Tap, on the other hand, is Google at its most Google-y. Long-pressing the home button causes a white line to trace its way around the screen -- once that's done, Google tries to figure out what you're looking at and gives you related information about it. After using it for a while, Now on Tap feels like one of those little touches that should've always been there. Let's say you're listening to something in Spotify, since Now on Tap plays nice with apps beyond ones Google has crafted. I've used the Hamilton example before, but let's dive back into it. Listening to the track "My Shot" (which you should definitely do) and invoking Now on Tap brings up four results cards: three for the principal singers in the song, plus one for the title of the song itself. It's also, sadly, far from perfect. Spotify songs are easy to figure out -- all that's on-screen to interpret is the name of the song, the artist and the album title. Launching Now on Tap on a web page, for instance, can be far less rewarding as Google doesn't always provide a results card for the things you want to see. Now in fairness, it's early days for this feature and it's pretty great in its current shape. Still, given how much of my own information I've willingly offered to Google -- all my emails, all the birthdays and meetings in my calendars, the entirety of my search history -- you'd think it would be able to get a better sense of what it is I'm actually trying to learn more about. Then again, that logic cuts both ways. For all that Google knows about us, it's (thankfully) not a mind reader and can't anticipate my desires on the fly. That Now on Tap will get better is a given; the question you'll have to consider is whether you want to give even more insight into what you do on the web. 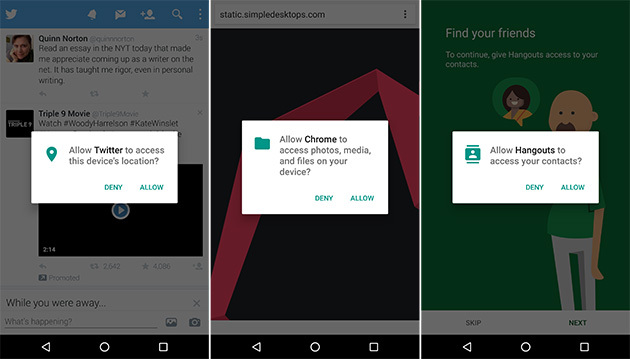 As damned helpful as Now on Tap can be, chances are you're going to experience Marshmallow's revamped approach to app permissions far more frequently. Let's flashback to last year: Before even downloading an app, users had to agree to a load of potential actions that software could perform at some point. With Marshmallow, Google very smartly decided not to front-load all that information and instead alerts you whenever an app you've installed tries to do something new for the first time, like when Twitter wants to figure out where you are or when Chrome wants access to your media. If an app mentions wanting to do something that makes the hair on the back of your neck stand up, feel free to deny it the access it wants -- in most cases, the rest of the program should still work. Oh, and if you're the kind of person who just taps "Accept" all the time anyway? Popping into the Settings reveals which apps have access to which parts of your device, from the camera to contacts to location, storage and even body sensors. Revoking access is just a tap away, so don't be afraid to make some executive decisions. Yes, you'll be dealing with these notifications pretty frequently, and yes, the whole thing feels a little more intrusive than before. Still, it forces users to understand what their apps are doing and when -- making everyone more security-conscious is worth some tiny inconveniences. Speaking of security, Marshmallow is very much into the idea of using your fingerprints as authentication. Need proof? Just look at the two new Nexus handsets. Setup is dead-simple and familiar -- you'll be lifting and pressing down onto the sensor multiple times until you're given the OK. Interestingly, Google doesn't assume that you want to use your fingerprints for everything once you've got at least one on file. 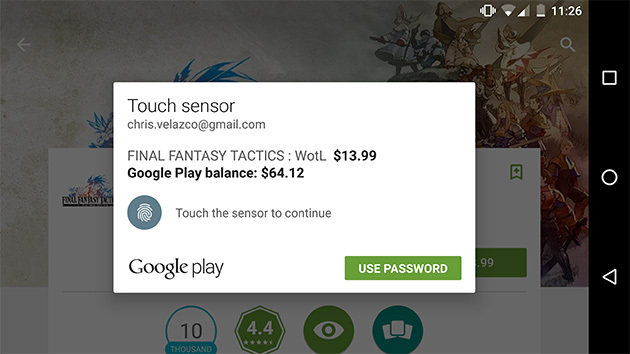 Buying apps from the Play Store defaults to using your password for authentication, for instance -- you have to tick a box before you can sign off on purchases with a finger. Once that's done, though, you're all good, and thankfully both of the devices I've been testing Marshmallow with (the Nexus 6P and the HTC One A9) have excellent sensors that quickly and accurately pick up finger touches. That's really no surprise, though: Google's very picky about how good these sensors should be. Now we just need more developers to get on the fingerprint bandwagon. Beyond some of those marquee features, Marshmallow also packs a few tricks to keep your device running for as long as possible. Doze is the more technically impressive of the batch since it determines when your device is just sitting around and shuts down nearly all background services and disables your network connection. If a priority message rolls in via Google Cloud Messaging, Marshmallow dutifully surfaces it, but otherwise you've basically got a device that automatically switches into airplane mode when you don't need it. The results are obvious, and impressive. As I write this, a near-dead Nexus 6P has been clinging to life with 2 percent battery for nearly an hour. Then there's App Standby, which automatically flips programs into an inactive state if they haven't been used in a while to further save your battery. If you've ever had to disable some carrier bloatware apps because they were just never used, well, that's basically the same idea here. The only difference is App Standby works autonomically -- Marshmallow disables apps that haven't been launched lately, aren't running a process or aren't generating notifications. The only potential downside here is that Marshmallow could always deactivate an app you actually wanted to keep, but there are two quick fixes: Open it once in a while, or jump into the Settings to manually restore it (you can even flag it so that it never gets deactivated again). Like it or not, the trusty microSD card slots of yore are disappearing from modern smartphones. If you're lucky enough to have such a slot handy (and haven't completely given yourself over to the cloud), Marshmallow allows you to format the card as internal storage so you can move apps and data that otherwise couldn't have been routed to an external card. Word to the wise: If you do this, don't panic at what you see. Marshmallow combines the storage counts into a single total (a feature called Flex Storage), but still offers a readout of how much room is available on both the internal and external memory. 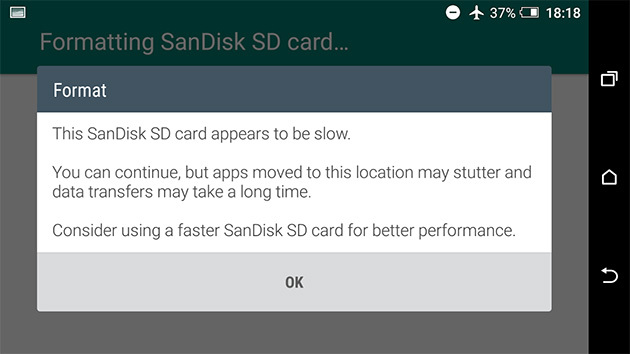 Your phone will also warn you when the SD card you're using is too slow to do much good --you'll want the fastest microSD you can get your hands on, and even a 16GB microSD card with transfer speeds up to 48MB/s prompted a stern warning. The best-case scenario is that you won't notice a difference between the two forms of storage when you start installing apps and moving data, but that's going to hinge largely on the kind of card you're working with. And if all of this sounds like too much effort, you could always just pop in a microSD card and treat it as portable storage -- that way, you can move files between devices without a headache. The coming of Marshmallow also means we've finally got a robust way to backup app data without the need for physical cards. It's called -- what else -- Auto Backup, which occasionally shuttles most of a user's app data into a dedicated corner of Google Drive that can easily be drawn upon again if you're reinstalling an app you've deleted. Oh, and in case you were worried, none of the space taken up by those backups count against your existing Google Drive quota. Marshmallow might not be the sort of dramatic leap forward we'd expect from Android 6.0, but let's not dwell on the number. What we've got here is an update that takes most of what was great about Lollipop, axed what didn't work (here's looking at you, convoluted volume controls) and added features we didn't even know we wanted. Sure, not everything has been executed perfectly, but the net value of features like Now on Tap, improved permissions, Flex Storage and others more than make up for occasional bits of flakiness. Android has never felt more complete -- now (if you'll pardon the pun) it's on manufacturers to make sure everyone gets a taste soon.